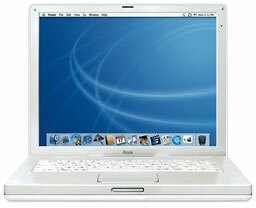 Mac Repair London is a full-service Apple Mac repair centre in London. We are dedicated to provide our clients with the best possible Apple iBook G4 repair and upgrade services for all 12-inch and 14-inch notebook computer models. Our trained and experienced engineers can handle any issue with your iBook laptop including scrambled or distorted video, intermittent video image, iBook G4 notebook will not turn on, computer starts up to blank screen, lines on the screen, hard drive failure, Mac laptop freezes, RAM slot failure, iBook G4 overheating or logic board failure. Let us help you with all your Mac notebook computer repair needs. If you have any questions about our London iBook G4 repair or upgrade services, please feel free to call us at 020 7394 2528 or e-mail at info@mac-repair.london.